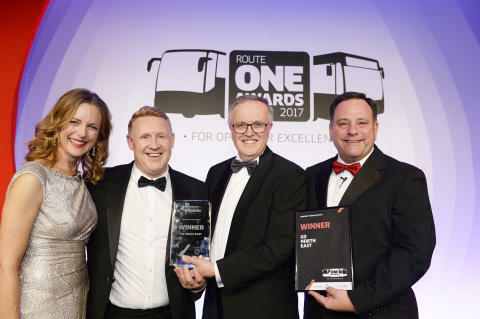 An industry-leading apprenticeship scheme, and a commitment to supporting training and development beyond the legal minimum, has earned Go North East top honour this month at the routeone Bus & Coach Transport Awards in Birmingham. The region’s largest bus operator beat stiff competition from transport peers from across the country, including National Express, Stagecoach UK Bus and sister company Go South Coast, to be named winners in the Operator Training category at the high-profile event. Each year, the routeone Awards honour those judged as the best in the coach and bus industry. Held on the evening of Wednesday 4 October, at the Hilton Birmingham Metropole, NEC, the 13th annual awards were presented by routeone editor Mel Holley and TV presenter Katie Derham. Also shortlisted in the Best Use of Technology category for its ‘News You Can Use’ campaign, Go North East’s success at the routeone Awards comes just a few months after its apprenticeship scheme earned the operator the Best Apprentice/School Leaver Recruitment Strategy accolade at the national Recruiter Awards. Go North East’s four-year employee-embedded scheme, implemented to tackle the industry’s skill shortage, receives more than 500 (545 in 2016) applications for the average intake of 10 new apprentices, each year. Over 90% of its current engineering workforce started their careers as apprentices. The selected apprentices train at Gateshead College’s £5.5 million Skills Academy for Automotive, Engineering, Manufacturing and Logistics based at Team Valley in Gateshead, where they are given access to the best training equipment, including a bus donated by Go North East for the apprentices to work on. Colin Barnes, Head of Engineering at Go North East, collected the award. He said: “At Go North East, we aim to provide the best customer experience possible, to everybody, every time; recognising that it is our people that will help us to achieve this goal.